The Season XVI WPT Tournament of Champions is around the corner. On Thursday, May 24, 2018, World Poker Tour title holders will embark on fabulous Las Vegas to compete in the prestigious event at ARIA Resort & Casino. The final table will play out at Esports Arena Las Vegas at Luxor Hotel & Casino on Saturday, May 26. In lead up to the event, WPT.com is featuring all of the winners from Season XVI, who, along with the hefty first-place prize, earned a $15,000 seat into the season-ending WPT Tournament of Champions. Up next is Ryan Tosoc, who topped a field of 812 entries in the WPT Five Diamond World Poker Classic to win $1.958 million. Ryan Tosoc achieved what was thought to be impossible on the World Poker Tour. Season XV witnessed Tosoc become a millionaire when he finished second to James Romero in the WPT Five Diamond World Poker Classic at Bellagio. A year later, Tosoc marched back to the final table through a field of 812 and to a heads-up battle against Alex Foxen with almost $2 million on the line. Tosoc completed the job in Season XVI, and with it, earned a place in World Poker Tour lore as a member of the WPT Champions Club. Bellagio is a second home for Tosoc. The Chicago native turned Las Vegas transplant built his bankroll in cash games within the walls of the famed poker room. Only 27, Tosoc is filled with eons of poker years on his odometer. The cash game career is what Tosoc is most proud of, but the prize that comes with winning a WPT title is is held in very high regard. The Hublot watch awarded to all Season XVI champions sits on Tosoc’s wrist every day when he plays. The “beast” that Tosoc refers to is the former life as a cash game grinder who spent day and night playing. Tosoc moved from Chicago to Las Vegas to build his career and peaked with his WPT Five Diamond win. Since that time, Tosoc has used his winnings to fund other life endeavors and lead a balanced life not consumed by poker. Tosoc says his goal is to write a book that chronicles the psychology of poker, and open businesses in Chicago. Those plans have not yet come to fruition and Tosoc instead passes the time he once spent playing poker on leisure activities. Poker now only takes up to two days per week for Tosoc. Tosoc’s recent tournament achievements do not distract him from his personal philosophy on the subject. The few moments of euphoria surrounded by melancholy is not a life that Tosoc wishes to lead. His future book captures those subjects and will frame them for an audience. There is a calm in Tosoc that manifests itself in basic interactions after defeat. Tosoc entered the WPT Bellagio Elite Poker Championship and busted through two $10,400 entries in the span of only 30 minutes. A tough day of poker for any player and Tosoc accepted the loss for the variance that it is and moved on. The win at WPT Five Diamond, one of the game’s most prized events, put a stamp of approval on Tosoc’s career that no run bad can wipe away. For Tosoc, the difference between first place and second along with the year in between results is incomparable. The rake-free $15,000 buy-in WPT Tournament of Champions is the largest buy-in ever played by Tosoc. A new avenue of playing against tournament experts makes Tosoc smile when describing his level of excitement. Mentioning fellow Season XV WPT Five Diamond final tablist Jake Schindler by name, Tosoc notes the great players involved is what he looks forward to most when he enters the competition on May 24 at ARIA Resort & Casino. 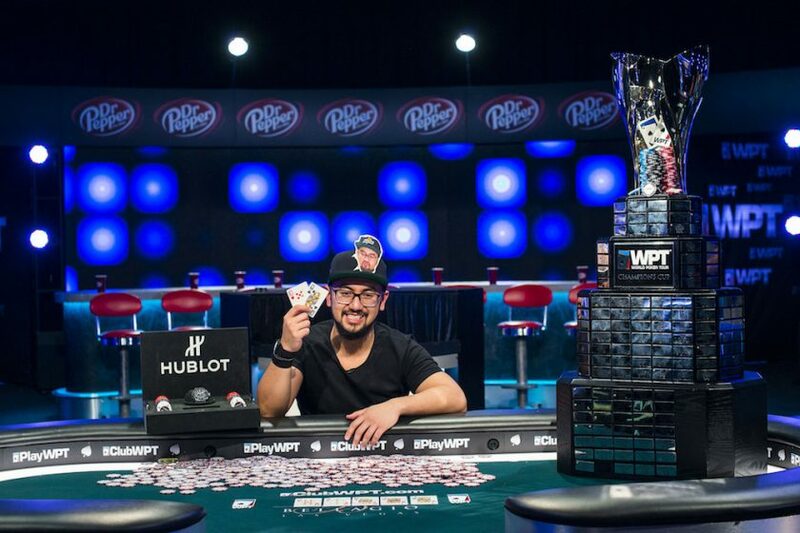 If all of his plans work out and Tosoc never plays in another cash game after this year, he still plans to play in the WPT Tournament of Champions every year.